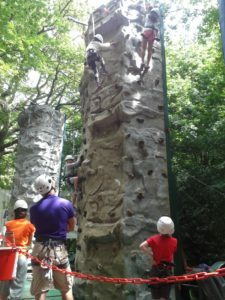 The Scouts at the Kent County Show encouraging adventurous spirits. The Kent County Show runs from today until Sunday and with over 400 exhibitors you would expect to find something for everyone – the show doesn’t disappoint. The atmosphere is gentle and energizing even though the site itself is vast. From the thrill rides of the fairground to the calm contemplative atmosphere of the flower show marquee, to enable you to make the most of your time here a showground map is essential. 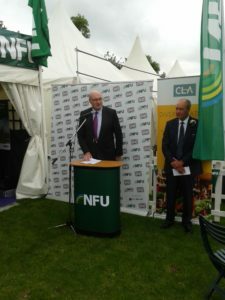 European Commissioner for Agriculture & Rural Development,Phil Hogan, addresses the farming community. 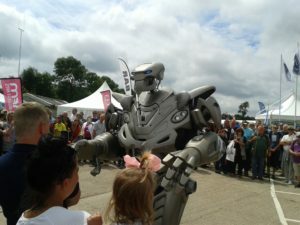 Although the Kent County Show provides a day of entertainment, it is also an important event for the country and farming community providing networking and trade opportunities. CLA stalls. It was a timely visit during the political turmoil created by the Brexit result, which was a main focus of the commissioner’s speech and indeed of the Q and A session that followed. Commissioner Hogan was keen to impress upon the farming community that although he was personally disappointed with the result, positive thinking was needed and explained, when asked, that any new trade negotiations would not commence until the EU exit negotiations were completed. Throughout the showground the focus is on the Kent community. With over 25 competition classes for horses alone, the Kent County Show is the place to be to witness some of the best bred animals in Britain and with no less than eight show rings within the ground, there is no shortage of entertainment and serious country competitions to attend. 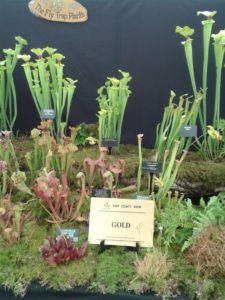 ‘The Fly Trap Plants’ Gold Award winner at the flower show. 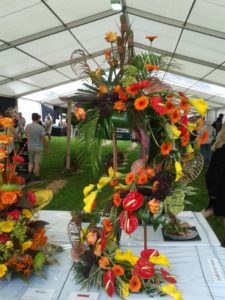 I spoke to Pauline Steward, who had attended the show alongside her husband, Bernie, entering the flower show competition with their display of ‘The Fly Trap Plants’. Having won ‘Best in Show’ last year, this year they won a Gold award and Pauline told me: “It took all day yesterday to install. The judge said it was a brilliant display”. Having grown Fly Trap Plants for over 30 years, Bernie originally only grew them in his garden greenhouse to keep bugs away from his prized orchids. Now the husband and wife team have a 60 foot greenhouse and poly tunnel dedicated to growing fly trap plants in what must be a labour of love to produce. As would be expected, the show concentrates upon local Kent companies and there is a large area dedicated to ‘Produced in Kent’ (stalls 344-375) which brings together 33 of their Kent members to exhibit their Kentish produce at the show – from Kentish beer, wine and ale through to crepes, locally produced food and food service stalls are in abundance and ‘Produced in Kent’ have had a large presence at the Kent County Show for many years. I spoke to Jo Gurr who works for ‘Produced in Kent’ and she said: “The Show offers a nice celebration of Kent. It is not often you get the chance to experience all aspects of Kentish life from the traditional to the new”. 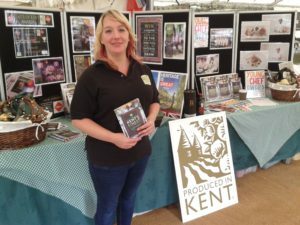 Like all the stall holders, ‘Produced in Kent’ aim to increase their brand awareness by being part of the Kent County Show and that was certainly the motivation behind the charity stalls I caught up with. Demelza House (stall 265) based in Sittingbourne were telling people about their new lottery with a £1000 jackpot being offered every week. Their Lottery Advisor, Debbie Stokes, explained: “Hopefully the lottery will be our biggest fundraiser to pay for 12 nurses per year” Demelza provides the best care and support for seriously ill babies, children, young people and their families, across East Sussex, Kent and South East London. 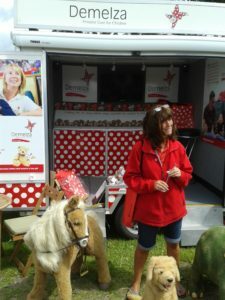 Also on site was their charity shop and for the first time this year they are selling donated items which they have collected over a three month period specifically to sell at the Kent County Show. Leon Olive and Lauren Ashby were manning the shop and hope to raise over £700 per day to raise money for Demelza and pay the costs of the site fee. 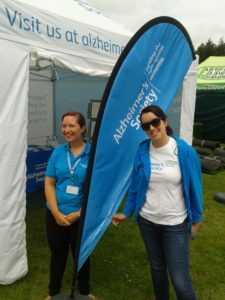 I also saw the Alzheimer’s Society (stall 139) who are at the Kent County Show to get their message out to the pubic. Services Facilitator Victoria Baldwin explained: “Just by being able to help one person at this event makes it all worth while”. 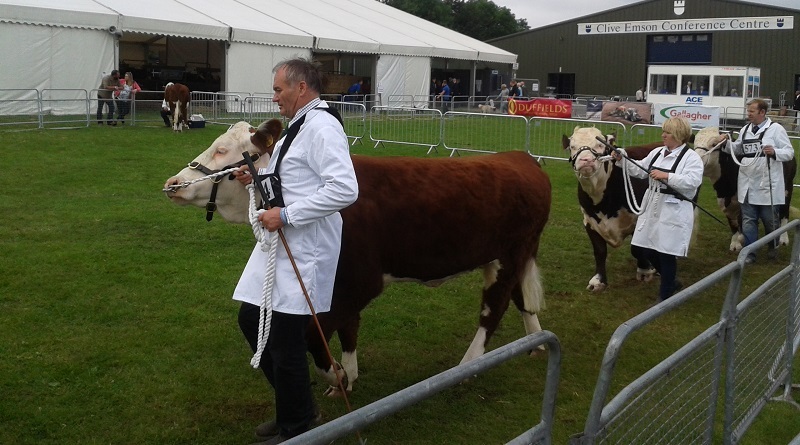 Their office in Maidstone is based in Linton Road with others in Paddock Wood and Lympne, between them they cover the whole of Kent and this is the first year they have exhibited at the Kent County Show. I spoke with Zoe Barber and Kelly King from the Hospitality Department of Leeds Castle (stall 242) who confirmed it was their first time at the Kent County Show too. 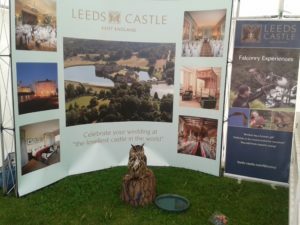 They told me about the wedding functions and opportunities to stay at the castle – a splendour which must be hard to resist for many – but it was Leeds Castle’s falconry display that was attracting the crowds, especially a small Scops owl named Merlin who was stealing the limelight. The youth of Kent were well represented by way of the Scouts (who were shimmying their way up a climbing tower) Hadlow College’s stall (stall 24) gave a great interactive overview of what their students were learning and the Kent Theatre Network (stall 313) were positively brimming over with enthusiasm to get people involved. Today ‘The Stag Theatre’ in Sevenoaks and ‘Orchard Theatre’ in Dartford were at hand to encourage those with a thespian side to them and give out information about their up and coming productions. Another charity close to our hearts here at In Maidstone E-Magazine was represented on stall 314 – Macmillan Cancer Support – and they informed me that on Saturday and Sunday between 11am and 4pm they were welcoming a dermatology consultant to the stall so people could check their skin for signs of cancer – well worth a visit. The European School of Osteopathy. The last stall on my whirlwind agenda of the Kent County Show was stall 87. 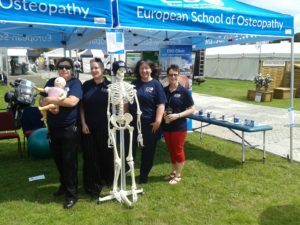 The ESO stall – European School of Osteopathy – based in Tonbridge Road, Maidstone and in Boxley. I was greeted by ex-paediatric nurse Jo Szarck, who runs the First Aid branch of ESO. This organisation have been based in Maidstone since 1971 offering a 4 year degree in human and animal osteopathy and reduced rates for osteopathy clients. New for the school, the first aid branch of the business is taking off and goes hand in hand with the osteopathy on offer. ESO’s Marketing Officer, Michelle Leach, told me they had launched a new headache clinic as well. As I wondered back towards the car park I was met by no end of entertainment on my way, from a one man band, morris dancers, Peppa Pig on walk about and vintage cars gleaming in the sun, through to ‘Titan’ (a huge robotic creature) greeting the crowds, all taking place with the poignant sound of spitfires flying over head. 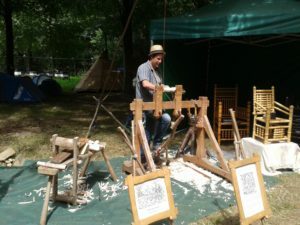 Kent County Show is primarily for those interested in the countryside and outdoor pursuits and yet the overwhelming atmosphere I took away with me was one of the Kentish community and people reaching out to each other. ← The Kent County Show this Weekend!